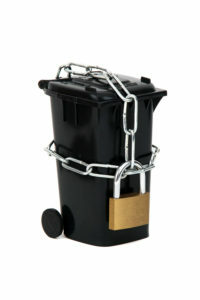 Lockable security bins in the workplace offer a secure and convenient way to dispose of such protected information and ensure it doesn’t get into the wrong hands. The Australian Document Shredding Service 240 litre bins can be placed on elected sites and collected regularly, or as a one-off service for guaranteed destruction of confidential documents, complete with a certificate of destruction. Australian Document Shredding Service is 100% Australian owned and operated servicing metropolitan areas in all major cities and available to small business, commercial sites and government bodies, our security bins are a simple solution in upholding the highest levels of security for your confidential business documentation. To maintain peace of mind for you and your customers in confidential document destruction, click here to order your security bins service today.